Useful sections are pages 247-249 common communication problems and solutions. Reference guide on pages 285-289 that outlines the book’s contents. “Idea Clinics” illustrate how an idea can be made stickier. They are worth studying. 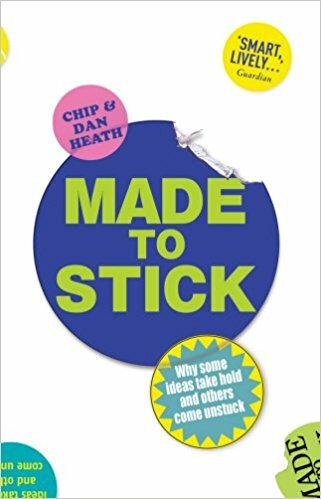 “Made to Stick” expands on the idea of “stickiness” popularized by Malcolm Gladwell in “The Tipping Point.” Gladwell only says that a sticky idea needs the right people and the right context, he doesn’t tell us much about the psychology. Our authors have experience in organizational behaviour and education. They claim that people who use their principles become more successful in communicating. Their prescription, and the outline of this book, is organized around the acronym SUCCES (with last s omitted from success). Simplicity is the key and first step to make a message sticky to others is to find the core message. What journalists call the “lead story”. Sentences beat paragraphs. Two bullets better than five. Easy words better than complex. Say one thing clearly (“if you say three things you say nothing”). Tie into schema (metaphor). It’s not a good story if you have to tell it 10 times. The Curse of Knowledge consistently gets in the way of our ability to successfully create “sticky ideas”. Once we know something, we find it hard to imagine not knowing. Tappers and Listeners. “We can’t demand attention. We must attract it”. Say or do something unexpected. Break the guessing machine. When everybody paints with lime green it no longer stands out. Eg. Comic sans MS script has become a cliché. An appropriate name. The town hall plaza started as a joke now in common use. Avoid obscure language. Include details to make your argument more convincing. ‘Translate’ statistics down to the human scale (the human brain cannot make sense of huge numbers! “Oral rehydration costs less than a cup of tea”. You are 300 times more likely to be killed by a deer than a shark. Brown eyes vs Blue eyes. A teacher explained racism to a class of young children after the death of Martin Luther King by dividing them into blue eyes and brown eyes and treating each group differently and that lesson was so powerful for the class that they all remember it 30 or 40 years later. If you present statistics or figures the response will be analytical thinking. A human story will evoke an emotional response. Money for Africa vs one little hungry girl. Which sounds more appealing? Sportsmanship or Honouring the Game? “I’m in charge of morale” as stated by a US military cook in Iraq. We must make people feel something to get them to care. We are wired to feel things, not abstractions. Chapter6: Think of stories as training, not entertainment. Like a flight simulator it prepares you to respond appropriately in times of danger. Proverbs endure. Aesop’s fables have persisted because they are stories. If they had been called “Aesop’s helpful suggestions” they might be forgotten by now. Challenge: Jared lost hundreds of pounds eating Subway sandwiches. Connection: Good samaritan. Creativity: Shackleton kept the complainers close to him. A good story changes behaviour – next time a stranger offers you a drink you will remember the kidney story!! Putting it into practice: How can we apply the techniques to promote WBG open day? Can this book guide us to “stickiness”? Ask “why” at least three times to bypass the curse of knowledge. 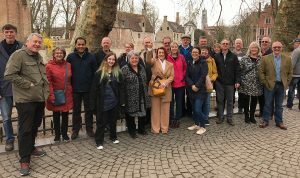 Why are we having an open day? Because we want some new members. (Concreteness: Chris Sturdy as shining example. Joined as jobbing builder, after 2 years progressed to multimillion pound projects). Loyalty program in car wash, 8 stamps get 9th wash free vs 10 stamps with first two already filled in 19% vs 35% got their free car wash. Make people think that they are already making progress.